Brooks & Barber provides its clients with the highest caliber of tree care that is both ecologically sound and competitively priced. Our staff consists of certified arborists and tree care experts who are fully insured and who utilize the latest advances in arboricultural science and technology. We believe continuing education is important. Research bulletins and seminars keep Brooks & Barber Tree Professionals abreast of the latest safety and environmental issues and modern tree care techniques. Client satisfaction is our number one priority, a reason many have trusted the care of their trees to Brooks & Barber Tree Management through the years. Our employees are taught safety, professionalism and courtesy to the client; our most important goals on a job site. 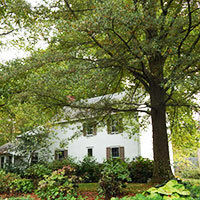 Clients have trusted the care of their trees and shrubs to the tree professionals at Brooks & Barber since 1986. Fully insured and committed to safety, for your protection. Services performed to the highest standards set forth by the International Society of Arboriculture. Professional, friendly, and cost-effective methods. Pennsylvania and New Jersey Certified Pesticide Applicators. Have Brooks & Barber do the job right the first time; the signs of improper tree work may take a few years to develop and cause irreversible damage.